You may recall from our pre-vacation post that we had “an obscenely long list of things that need to get packed and a tiny baggage allowance.” Well, we did it – we packed everything we needed for an 8-month-old baby going to Europe for two weeks. Bottles – We would’ve considered bringing the Playtex bottles with the disposable inserts so we didn’t have to do dishes every night. Although, we’re not sure how to mix the powder with water in that case. Dishwashing detergent, travel size (to clean bottles in hotel sinks) – See above. If we didn’t use the Playtex bottles, we would’ve brought more detergent, since we definitely ran out partially through the vacation. Formula, powder and pre-mixed (25 oz per day) – We wished we had brought more liquid formula. 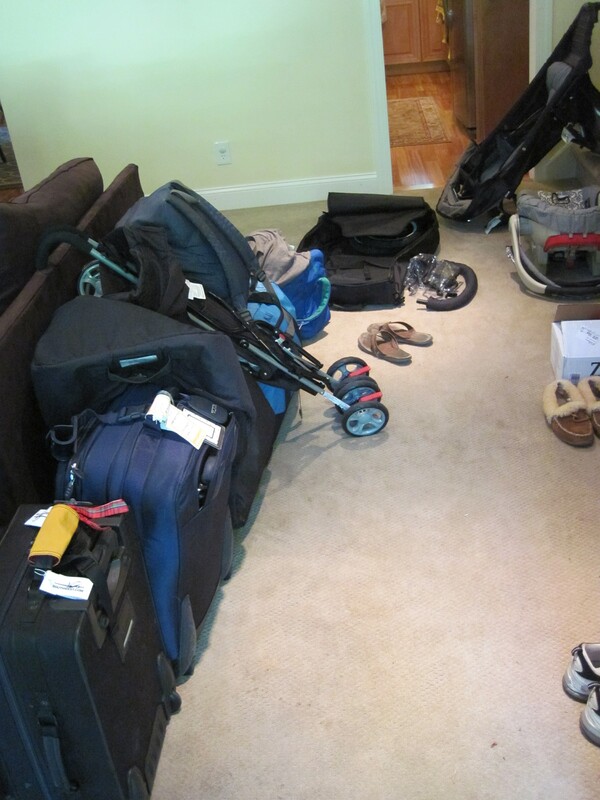 This was an issue because the liquid formula weighed so much that our bags were overweight and we had to pare down. But, when we got to Spain, we discovered that Kasen does not tolerate the powder formula well – he started spitting up a lot more than usual (oops – should’ve investigated that before we left). Water purifier (so we don’t have to buy a lot of bottled water for formula) – Seemed like a good idea, but we ended up mostly buying bottled water anyway. Bibs, disposable for solid food meals and reusable for bottle meals – ended up just using the reusable bibs. We didn’t use one disposable bib. Solid food (90 packages!) – Only packed about 40, and that was perfect. Burp cloths – Wish we had brought more than 6, but our little man is quite a spitter (and, see above, re powder-formula reaction). Disposable placemats – we didn’t use any of these. He just ate on restaurant high chairs and table tops that were wiped down with washcloths. Spoons – When we got to Spain, we discovered that we only packed one. And then we spent the next 3 days worrying that the one spoon we had was going to get lost. Then we discovered two more in the bottom of the diaper bag. Phew. Peapod (a small, portable baby bed) – We wouldn’t have brought this. Kasen mostly used hotel cribs, which worked better. When he wasn’t in a hotel crib, he was in our bed. We still love the Peapod though and highly recommend them. Crib sheets – wouldn’t have brought these, again, because Kasen mostly used hotel cribs and not his Peapod. Blanket(s) – we brought two plush blankets for Kasen to sleep with and six thin flannel blankets for, well, everything else. Looking back, we would’ve only packed one plush blanket. He liked to sleep with his own blanket though, for sure. Travel soother – Excellent idea. We brought Kasen’s seahorse soother, which was a real reminder from home. He liked it. Footed pajamas – wouldn’t bother with these. The hotel rooms in Spain were so hot that he needed to sleep in a onesie every night. Hat – make sure it’s the right size! Kasen outgrew his before the end of the trip…. oops. Sunglasses – didn’t pack these. Let’s be honest, Kasen just takes them off anyway. Swimsuit – we brought a swim suit, a disposable swim diaper, and a reusable swim diaper. We love his reusable swim diaper (from iPlay) and we ended up using that the whole time. It was surprisingly easy to clean in the bathtub when soiled. We contemplated bringing two swim suits (after all, what do you do when one is wet? ), but we were happy with just one. If it was wet, we used the hotel blow drier to dry it right up. Diapers (75 diapers!) 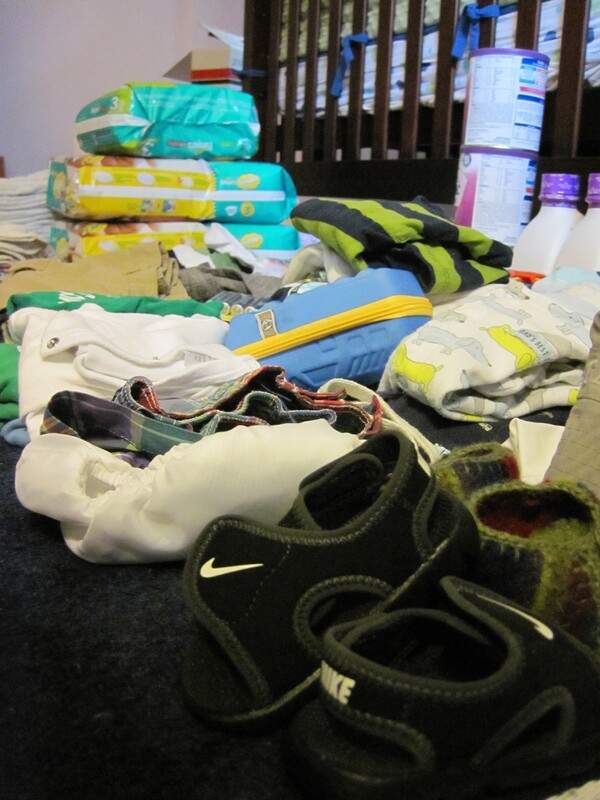 – we brought 55 regular diapers, 20 overnight diapers, and 5 swim diapers. We had just enough regular diapers (i.e. if Hurricane Irene had delayed our return home, we would’ve had to buy more) even though Kasen had a stomach bug/allergy that cycled him through a lot of diapers for a couple days. We would’ve skipped the swim diapers. The overnight diapers were used when we had long travel days and weren’t sure when Kasen would be able to get a diaper change. Diaper rash cream – also pack antifungal cream! When the baby gets a stomach bug, it can result in a yeast infection that looks like diaper rash. Kasen had that happen while we were away. Fortunately, there was a tiny bit of antifungal cream in the diaper bag that we forgot about, but next time we would’ve packed more! Changing pads, disposable and regular – should’ve packed more than 6 disposable. Ziploc bags – need LOTS of these. Baby laundry detergent, travel size – ran out of this too. Should’ve brought more. Everyone had very dirty clothes by the time we came home. Umbrella Stroller – We brought the umbrella and the regular all-terrain stroller (we have a Phil & Ted’s Dash). Kristin thought we would use the all-terrain when we were running, at the beach and in the mountains and the umbrella everywhere else. (Roads? Where we’re going, you don’t need roads.) Krister said not to bring the all-terrain. Who was right? Krister. We ended up just using the umbrella and never taking all-terrain out of the travel bag. Oops. Swim toy (this is really for Kristin & Krister, so the baby can entertain himself in the pool without their having to carry him everywhere) – we didn’t use this either. Which was a surprise to both adults. Great Scott! That’s a lot of stuff. We were pretty amazed with our awesome packing skills. We packed pretty much everything we needed. And a few things we didn’t. ADDITION: We also packed a portable high chair. We didn’t expect to use it, but it turned out to be very helpful at meal time. We’re glad we brought it!